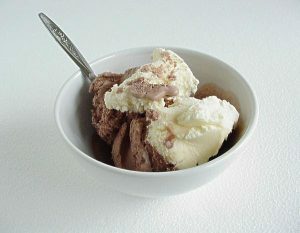 Emotional eaters live with guilt and shame. They ask themselves questions such as, “Why can’t I stop eating? What’s wrong with me? Why don’t I have any willpower?” It’s not something discussed at the water cooler. Would you be comfortable sharing that you binged on a bag of potato chips or a pint of ice cream with your co-workers? I certainly wasn’t. So ask that of yourself. Dig deep and find out what’s going on in your mind that’s creating chaos and triggering you to eat candy and cake and cookies and pretzels (or whatever it is that soothes you). Be gentle with yourself. Don’t judge. There’s nothing wrong with you. You have feelings; that’s normal. Allow yourself to feel the feelings, don’t feed your feelings. I am so stupid! Why did I just eat that bag of candy? 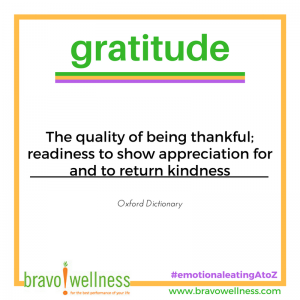 I am grateful for this moment – to understand who I am, how I feel and what I can do to stay strong and aware of my feelings and actions. Believe me, I get that this may be easier said then done. Think of it as going to the gym – the first time you try to pick up a 10 lb. weight, it feels really heavy. So you start off with a lighter weight – perhaps two or three pounds. You keep doing exercises and building muscle mass, and soon that 10 lb. weight doesn’t feel as heavy as it once did. You are working your biceps and triceps and getting stronger. 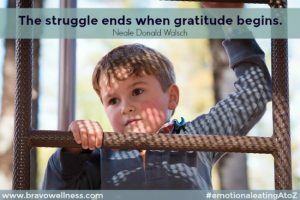 It’s the same with turning guilt into gratitude. At first, it may seem too heavy, too difficult to deal with, and you’ll think – this isn’t for me; I’m going to struggle for the rest of my life. But you keep doing it – making a positive statement instead of feeling guilty and asking yourself shameful questions – like going to the gym every day. And then your mindset shifts to an attitude of gratitude, and you begin to feel positive and optimistic. With this, you will notice that you allow yourself to feel your feelings, process them, understand them and move forward and enjoy your life — without emotional eating binges. 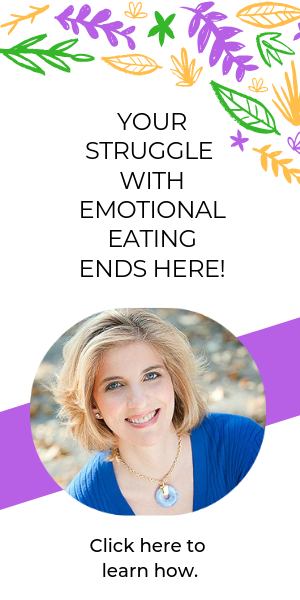 ​​​​​​If you want to explore how you can end your struggle with emotional eating, remove the guilt and live with gratitude, I invite you to set up a complimentary phone call with me. I’m happy to speak with you and help you discover the right path for your recovery process.